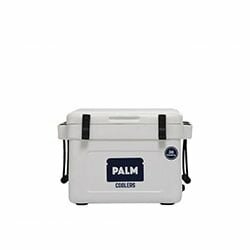 Palm Coolers is another one of those small-time brands (they’re based out of Chicago) that’s managed to pop out good quality coolers recently at super low prices, and they’ve managed to keep a relatively low profile on the industry radar while doing so. 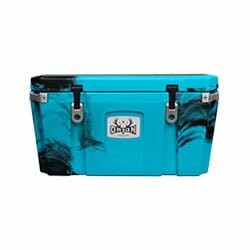 Ever since Yeti and the like have had success selling their rotomolded super coolers at astronomical prices, several manufacturers (RTIC, Palm, Techni Ice, etc) have made it a point to show potential buyers that they can get similar quality products, without having to pawn their second-born child to pay for it. But are they worth it? While these cheap rotomolded coolers aren’t what we call ‘Yeti expensive’, they’re still pretty darn expensive. In this in-depth Palm Coolers review, we’ll take a good look at the construction quality, durability, and overall value of their coolers, and decide whether or not they’ve put their money where their mouth is and are able to hang performance-wise with the big dogs in the industry. So how are companies like Palm able to sell supposedly equal-quality products at less than half the price? It really comes down to size. They (and other brands like them) have a small staff, and there’s only a handful of people that manage everything – from manufacturing to shipping to customer service. Also, they’re what we call ‘factory-direct suppliers’ – the cooler essentially goes straight from the manufacturing warehouse (these are made in Thailand – really nice place on the earth by the way!) 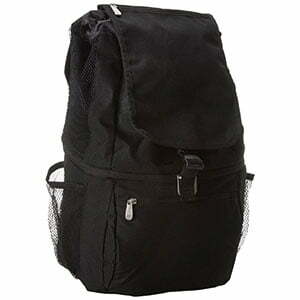 to one of two Palm Coolers distribution centers (Chicago or L.A.), before making their way out to your doorstep. 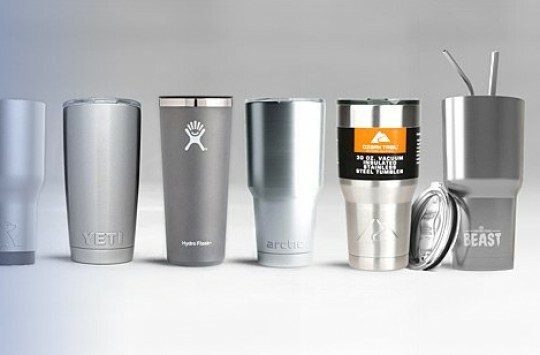 With third party retailers not in the picture, the company’s able to sell at a lot lower price than, say, a Yeti. 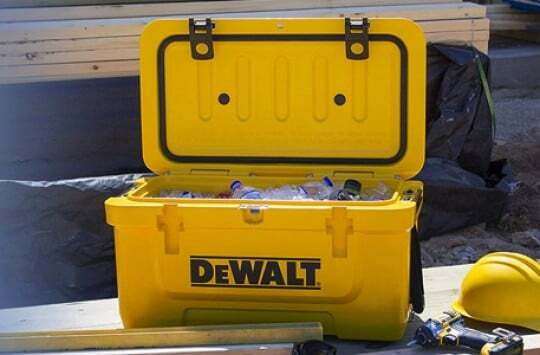 Construction, Quality, and Performance: Are Palm Coolers Worth Their Weight in Gold? 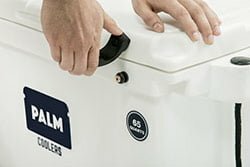 Like all rotomolded coolers, the frame/body on Palm ice chests are made of a super high-end plastic that’s poured into a mold as a liquid, then rotated uniformly as the liquid hardens, ensuring 100% rigidity throughout the cooler body. This is the major upgrade in quality over non-rotomolded coolers, which have thinner walls and nowhere near the insulation capacity. 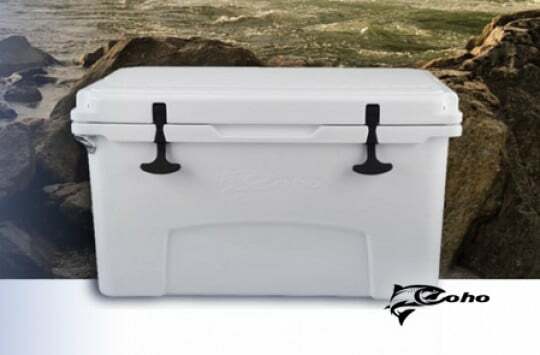 The central dogma of a great cooler is that you don’t want air to either enter or leave once the lid is closed, and one-piece rotomold designs have proven to be the most effective way to achieve this. Of course, the insulation that goes inside the plastic rotomold is just as important as the rotomolded body itself, and Palm Coolers uses 3” of standard high-density foam as the insulating material (most other high-quality rotomolded coolers use 2”). 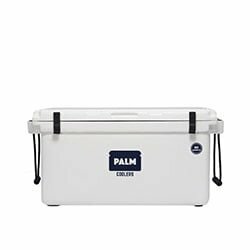 Every size Palm Cooler is rated to hold ice for a maximum of seven days, but this is probably a bit generous in all honesty. Three to five days would probably be a more realistic expectation, depending of course on weather conditions. TIP: Find out how to maximize ice retention of your cooler using some of the best reusable ice packs or putting a dry ice into it. 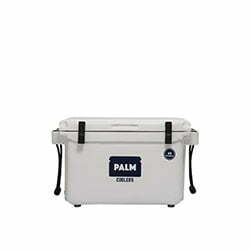 Palm Coolers currently has five different models/sizes available: the PC 30, PC 45, PC 65, PC 90, and PC 145. (Unlike other companies, the number actually refers to the volume of the cooler: the PC 30 is a 30-quart, PC 45 is a 45-quart, and so on). Each size comes in either beige, grey, or white, and has all the standard features like one-piece molded padlock eyelets for secure storage, heavy-duty rope handles, a 360-degree gasket, all stainless steel hardware, and a one-piece hinge system that you’ll never have to worry about breaking. Like their ultra-expensive counterparts, these things are incredibly durable, and specifically built to be able to endure brutal outdoor conditions; stand on it, strap it to your boat or truck, load it down with fish or game and haul it out of the backcountry – it’s definitely up for whatever challenge you want to throw at it. And as far as warranty, Palm Coolers definitely isn’t afraid to stand behind their product – they offer a really solid 10-year warranty on all of their hard sided coolers. Like RTIC, Palm Coolers also has a couple different cheap tumbler cups available (20 oz and 30 oz), in addition to their cooler lineup. 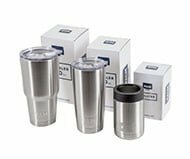 Both sizes come with a good splash-proof lid, and are constructed of stainless steel with double wall vacuum insulation – whether you’re trying to keep your goodies hot or cold, they’ll perform just as well as the Yeti Rambler, no doubt. They also offer the tumblers in discount bulk packages (boxes of 24), which are a really popular buy for companies and businesses. Pretty self-explanatory: a really cool, really good quality koozie to stash your 12-ounce can or bottle in and keep it ice cold all afternoon long in the summertime heat. 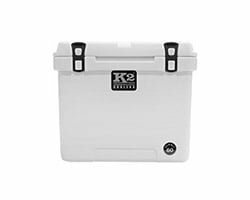 TIP: If you are interested in some good quality and even better price koozie, check our RTIC Can Cooler Review. 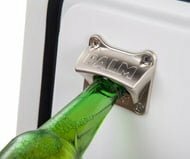 A really cool bit of flair that easily attaches to the side of your Palm ice chest. Not to mention it’s a bottle opener, so it’s actually super functional as well. Made of quality stainless steel with the Palm logo engraved. 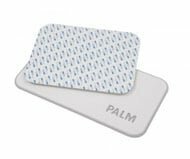 Available in all 5 different sizes, these non-slip pads are made from 6mm EVA foam, and stick onto the top of your Palm cooler with industrial-strength adhesive. An awesome accessory if you plan on standing on your cooler a lot or using it as a casting platform. (Prices depending on the size). Check out Accessories section on Palm website to find out more handy stuff, including replacement parts and hardware upgrades. Like we mentioned in the intro, since they’re such a small company it can be kind of tough trying to find Palm Coolers for sale. Amazon is always our first recommendation, as they generally have competitive prices and are almost always in stock with great shipping times. 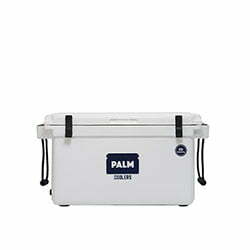 Here’s the link to Palm coolers listing. If a particular model is out of stock on Amazon, you can also buy direct through the Palm Coolers website (here), although you’ll probably end up paying a bit more for shipping. Alright, so what’s the verdict? 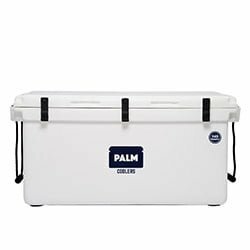 Are Palm Coolers worth the money? In our opinion, definitely. 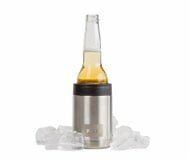 They’re very nice, good quality rotomolded coolers that perform well and – most importantly – are less than half the price of the big brands like Yeti and Pelican. And one more major thing to consider is shipping time – unlike most RTIC coolers which are backordered for up to 60 days, Palm Coolers (at the time of this writing, at least) are always in stock and ship UPS within 1-3 business days of an order being placed. In the comments section below let us know if this Palm Coolers Review was helpful for you and what are your thoughts on them. Great information! 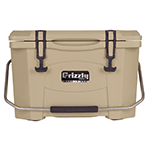 My husband is really researching coolers right now (before camping season) and he was so impressed by your write-up that he wanted me to read it! Thank you for writing such an informative review – we appreciate it! !